Main Dish Recipes for St. Patrick's Day! 1.First heat oven to 375 degree F. Spray 2 1/2 to 3 quart casserole baking dish with non-stick cooking spray (A 9-inch square baking dish can be used for a 2 ½ quart casserole baking dish.). 2. Take a 12 inch skillet. Add ground beef and onion and cook until browned. Drain grease. Add beans, corn, tomatoes, gravy, thyme and salt. Cook it and until heated through. 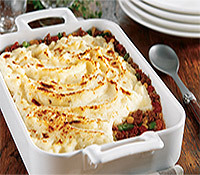 Put the beef mixture into casserole dish and spread "simply potatoes” evenly over beef mixture. Bake it for 30 to 35 min. Remove from oven. 3. Heat broiler and broil casserole 4-6 inches from heat for 3 to 6 min. Until "simply potatoes” are lightly brown. 1. Take a large non-stick skillet. Add oil and heat it on medium - high heat. Cook it "simply potatoes shredded harsh brown" according to package direction. 2. Cook bacon, meanwhile, ground beef and onion in 12 inch non-stick skillet until meat is browned. Drain grease. Add cabbage, beef broth, apple juice and salt. Sauté. 3. Reduce the heat. Cover the skillet with a lead. Occasionally lift cover and stir until cabbage is tender and harsh brown. Place corned beef in Dutch oven, and barely cover with hot water; add onion, garlic, cloves, and bay leaves. Cover and simmer (do not let boil)1 hour per pound of meat, or till fork tender. Remove meat from liquid; add potatoes and carrots. . Cover; bring to boiling and cook 10 minutes. 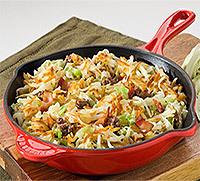 Then add cabbage wedges; continue cooking 20 minutes longer or till vegetables are done. If you like, glaze the corned beef while vegetables cook. Spread fat side of meat lightly with prepared mustard. Then sprinkle with mixture of 1/4 cup brown sugar and 1/4 teaspoon ground cloves. Place in shallow pan. Bake in moderate oven 350 degrees 15 to 20 minutes or till nicely glazed. Coat all sides of the meat pieces in flour. Heat oil in a skillet and brown the meat bits. Add onions and garlic. Saute. Toss the browned meat, onions and vegetables into a large cooking pot. Place herbs in the middle of the mixture. Cover with broth and cook for 2 hours over low temperature. While the stew is cooking, you can make the dumplings. Add the dumplings 20 minutes before stew is done. Add salt and pepper for taste. Mix the dry ingredients together in a large mixing bowl. Add shortening and egg. Whisk all the ingredients thoroughly. Divide mixture into small ball shapes. Roll these into even rounds with your floured hands. Place the molds in boiling water or broth. Cook for 15 minutes. Add to stew 20 minutes before stew is done. Preparation : Make stuffing. Rub meat with salt, pepper and butter. Pour cider or water into 3 -quart casserole dish. Place meat along edges of dish. Place stuffing in center of pan. Cover loosely with foil and bake 1 hour at 350 degrees. To potatoes, add butter, onion, apples, herbs, salt and pepper. 1) All-purpose flour - ½ cup. 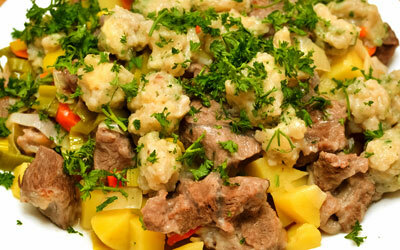 4) Boneless lamb stew meat (preferably shoulder) - 3 pounds, trimmed of excess fat and diced into 2" cubes. 5) Canola oil - 3 tbsp. 6) Onion - 1 large, chopped. 7) Dried thyme - ¾ tsp. 8) Dark beer - 1½ cups. 9) Potatoes - 1½ pounds, medium-sized, peeled and cut into quarters. 10) Carrots - 1 pound, peeled and cut ½ inch thick diagonally. 11) Fresh parsley - 3 tbsp, chopped. 1) A large mixing bowl. 1) Pour flour into the mixing bowl and season with salt and pepper. 2) Dredge lamb in flour mixture, shaking off excess. 3) Turn on the oven and heat oil over medium temperature. 4) Brown lamb on all sides, working in batches. About 5 minutes should be alloted per batch. 5) Transfer the roasted lamb to a plate. 6) Pour ¼ cup water into the pot. 7) Add in onion and cook for about 5 minutes, stirring occasionally with the wooden spoon, until water has evaporated and onion has started to become tender. 8) Place lamb in pot. Add in thyme, beer and 1½ cups water. Stir. 9) Cover the ingredients and simmer for about 1-1½ hrs or until lamb is tender. 10) Add potatoes, carrots and ½ cup water. 11) Cook under cover for about 20 minutes or until vegetables are tender and stew has thickened. 12) Season the stewed lamb with salt and pepper. Remove from heat and cool completely before storing. 13) Stir in parsley just before you serve. In a skillet cook the bacon pieces until they turn golden, and then drain on paper towels. Brown sausages (prick in several places with fork) in bacon fat; drain on paper towels and slice into 1/4-inch pieces. Peel and slice potatoes about 1/4-inch thick. In a casserole dish, alternate layers of bacon, sausage, onion, and potato, seasoning the potatoes with salt and pepper. Sprinkle each layer with a little parsley. Pour off all but 2 tablespoons of fat from the skillet. Add water and bring to the boil. Pour over the potato casserole. Cover and bake at 350 degrees for 45 minutes. Remove the cover and cook for an additional 15 minutes, until the top is browned and potatoes become tender. Heat oven to 2500. Arrange bread cubes in a single layer on a baking sheet. Toast in the oven until dry. Crush or process cubes in a food processor until you have medium crumbs; set aside. Increase oven temperature to 3500. In large bowl, mix together cream of mushroom soup, milk, onion, corned beef, dry mustard and sugar. Set aside. Spread sauerkraut evenly in bottom of a lightly greased 9x13" baking dish. Place potatoes in single layer, slightly overlapping, over 'kraut. Spoon soup mixture over potatoes and top with cheese. In small bowl, combine melted butter with rye bread crumbs, and sprinkle mixture over cheese. Cover and bake 50 minutes. Remove cover and bake 10 minutes more.